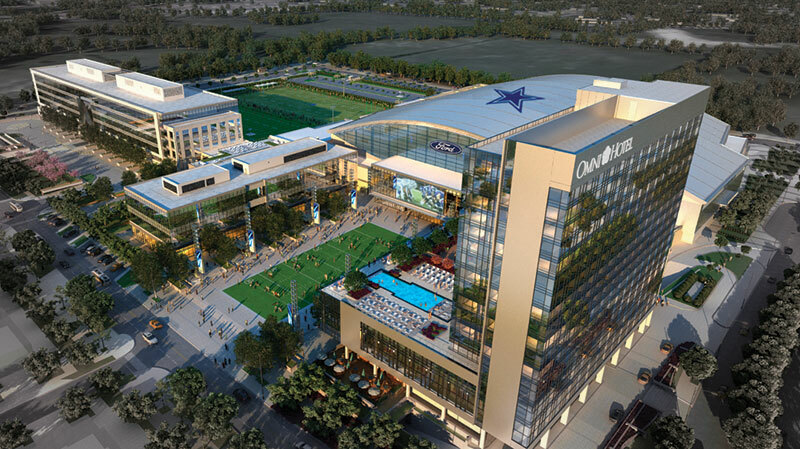 The central temple of all NFL sports complexes lies just twenty miles north of downtown Dallas, where Omni Hotels & Resorts is putting the final touches on a new full-service luxury hotel catering to business, meeting groups and sports-crazed travelers. The only upscale property in Frisco, the 300-room hotel is the cornerstone of a mixed-use development that involves pro football, retail, entertainment, offices and a medical center. Key to maintaining the feel of a luxury property, the hotel placed emphasis on sound transmission class (STC) in its wall designs by using QuietRock®, the highest performing sound damped gypsum brand on the market. Mechanical, plumbing and electrical systems in hotels, condos and office buildings are often sources of noise complaints by occupants. The hum from a transformer, the grind of rooftop condensing units or water traversing through plumbing pipes in walls, are among the many sounds that can disturb building occupants and cause complaints. QuietRock sound reducing gypsum panels were installed throughout the 16-story structure, in guest rooms adjacent to the hotel’s mechanical and maintenance yard. David Smith, Division Manager for specialty drywall contractor Marek Brothers Systems-Dallas, was relieved at the opportunity to use a simple solution to a big challenge. With the help of Larry Goss, of distributor Foundation Building Materials-Dallas, Smith was able to use one layer of QuietRock to meet the hotel’s high STC requirements. Smith sums up “everything went well and as expected." The new hotel is connected to the Ford Center at The Star, which opened last year. The 91-acre complex includes a publicly owned 12,000-seat multi-purpose event center that will be used by the City of Frisco and the Frisco Independent School District to host a variety of activities. Besides graduations, special events and athletic competitions, it will also attract attention as the site of high school football championship games. The hotel’s main floor includes 24,000 square-feet of flexible meeting space and a 13,000 square-foot ballroom. The top floors accommodate the Presidential Suite and 27 others, and a rooftop deck with a swimming pool sports fire pits, cabanas, a restaurant and room for up to 400 guests. That section overlooks a plaza area that will be a focal point for future development. All of the rooftop and mechanical equipment noise can’t penetrate a wall protected by QuietRock 545. The only sound damped panel designed for maximum sound isolation across a broad frequency range, it offers high STC ratings (up to STC 80 in certain assemblies) and outperforms complicated conventional sound isolating assemblies. The QuietRock 545 is a one of a kind, multi-layer laminated panel that measures 1-3/8 inches thick and weighs 6.7 pounds per square foot. The mass of the QuietRock 545 makes it a great choice for the new Omni Hotel. It’s also a preferred sound isolation panel for commercial and hi-end home theaters, professional studios and music rooms.